Meet Mackenzie, founded of Rooted & Wild. She will be hosting our Wreath Workshop on Sunday, December 2nd from 12pm-2pm! We got to pick her brain about how she got started, her floral design tips, and her favorite flower. Scroll on to read more! Q. Curious to know how it all began – how did you get your start? A. Well, I kinda stumbled into flowers by accident. When I was 18, I started working at a local flower shop while I was going to school. After working there for a while, I went off to work with a wedding florist, who specialized in large scale weddings and corporate events, but still had a unique design style. Lets just say 6am flower market runs became way easier and sounded way more fun than an 8am math lecture. I just never looked back after that. Q. Describe your floral style for us! A. I think my style is organic but also a little wild too. I love following the curves of the flowers and creating unique lines. For a lot of my installs, I think a lot about how, whatever element I’m using, it looks when its growing in nature. Q. What’s the process like? A. Like the process of inspiration or designing flowers? I feel like I don’t have a routine process. I love bouncing ideas off people, I have a few close friends/creatives who I do that with! Sometimes the process starts off with a photo from Pinterest that strikes inspiration or sometimes it comes from being outside. The process for designing has a lot to do with where I'm pulling my inspiration from too. Q. What’s your favorite arrangement you’ve ever done? A. Ahh it’s so hard for me to choose a favorite anything. I don’t think I have one favorite arrangement, but I always have one or two things that I love the best from every event. For weddings its usually the bridal or ceremony and for parties there’s always one centerpiece that I love the most! Q. Tell us more about you! What’s your background? A. I grew up in a pretty creative household. As a kid, my dad and I would work on all different kinds of art projects or garden in the backyard on the weekends. I have a photo from when I was maybe four or five holding all my gardening tools. My dad always jokes that it was the early days of Rooted & Wild. The creativity has always just stuck with me as I've gotten older. I love it all. Sometimes, I think that if flowers weren’t my thing, I would have loved to go into interior design. Honestly, my dream one day is to have a design company that does more than just flowers; but for now, I am really happy with where my business is at and how its growing. Q. What’s your favorite flower? A. Ranunculus will always have a special place in my heart but I feel like every season something new pops up at the flower market and that becomes my favorite haha. Q. What’s a typical day in the life? A. It usually starts with lots of coffee, and honestly it depends on what's going on that week. If it’s an event week I try to keep Mondays and Tuesday’s as mellow as possible, knowing that it’s going to be a busy end of the week; usually emailing and catching up from the week before. If it’s a prep + design day, it starts off at the market pulling flowers, filling buckets, prepping containers and then designing it all. Q. 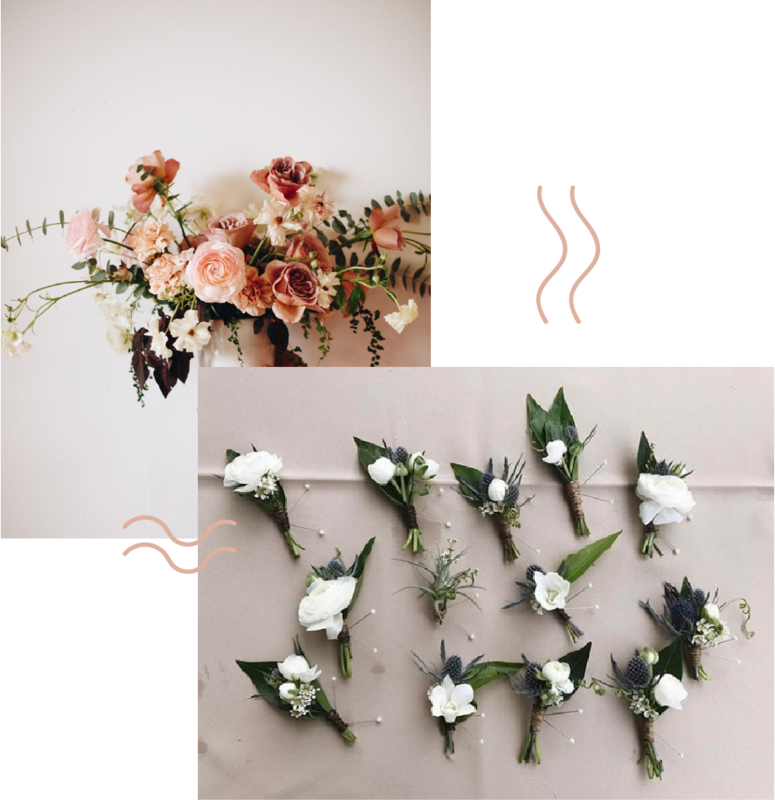 Any simple floral design tips for non-professionals? A. My biggest tip would be to trust yourself and don’t overthink it. It’s easy to get in your head about it. Everyone is creative in their own way so embrace it and don’t force yourself. There is no right or wrong way to be creative and make art!